"The May 22, tornado devastated Joplin. On the ground for 13 miles, in 20 minutes it claimed 160 lives and caused $151 million in damage. Joplin High School was a total loss. Two days later, the Joplin superintendent emphatically stated school would open as scheduled on August 17. An abandoned big-box retail space was selected for an adaptive reuse to house 1,200 students. The design had to be more than a stop-gap solution. The new high school needed to inspire students and serve as a rallying point for the community. 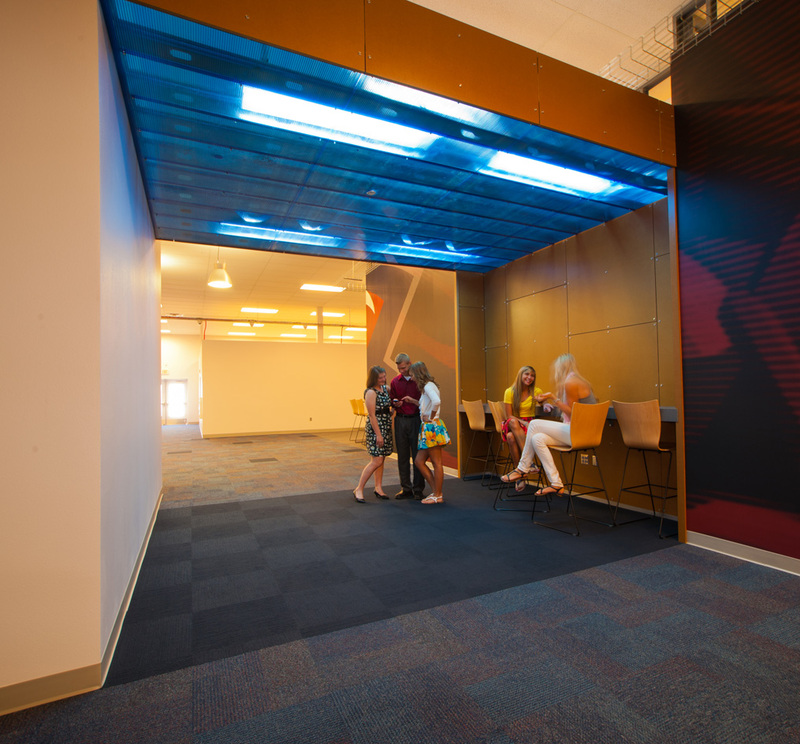 The design integrates every square inch of the existing space and features 21st century learning environments utilizing flexibility and interconnectivity. Large openings, oversized pivot doors, and a diverse array of furniture allow students to customize spaces for collaborative learning. An established HVAC system dictated lower wall heights to enhance airflow. Hints of plastic panels and stained MDF add expression to the design. Vibrant Eagle logos and graphics help give the students a sense of ownership. In total, the space inspires students to move beyond the tragic events of the past and move forward with their fellow students in a space that is truly a healing and learning environment for students, faculty, and the community."